Shairice was the busiest person and still had time for everyone! 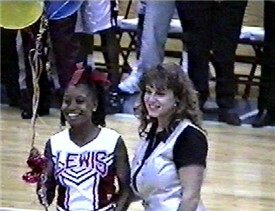 The 98-99 Lewis Cheer Team performed an exhibition at The Midwest Cheer and Dance Championship at Valporaiso Univeristy. Shairice drove all the way out there too! Here we are sitting with the team during the awards ceremony! 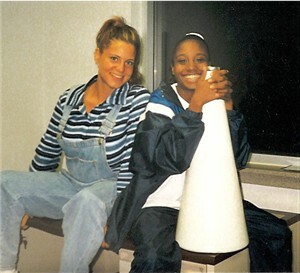 While coaching her junior high team, choreographing Lewis dances, tumbling classes, taking Grad classes in Dance and substitute teaching, Shairice found the time to participate in the Miss Illinois Pageant in 1998. 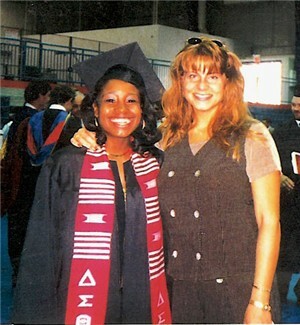 Shairice was named Miss Illinois Outstanding Performer 1999 for her awesome performance and showmanship. Here she is with Miss Teen Outstanding Performer.